This week Senator Chris Van Hollen from Maryland and Congressman Bobby Scott from Virginia introduced the Chesapeake Bay Farm Bill Enhancements Act of 2017 in both the House and Senate. This bill is essential to maintaining and restoring clean water in the Chesapeake Bay watershed. Covering more than 64,000 square miles, the Chesapeake Bay is the largest estuary in the United States and one of the most productive in the world. In any given year, seventy to ninety percent of all striped bass (known locally as rockfish) in the Atlantic Ocean were spawned in the Chesapeake Bay. With all of those fish, it should be no surprise that the Chesapeake Bay supports the largest breeding population of osprey (also called a fish hawk, since that’s all they eat) in the world. In addition, another raptor that feeds mostly on fish, the bald eagle, calls the Chesapeake home – more than 2,000 breeding pairs of bald eagles reside around the Bay. The blue crab, whose Latin name Callinectes sapidus means “beautiful swimmer,” and the eastern oyster are perhaps two of the most iconic species found in the Chesapeake Bay. Unfortunately, polluted stormwater runoff, over-fertilization and pollution from animal wastes, deforestation, wetland destruction from agricultural, urban, and suburban development, and sea level rise caused by climate change is threatening the Bay’s future and the fish and wildlife that depend on it. 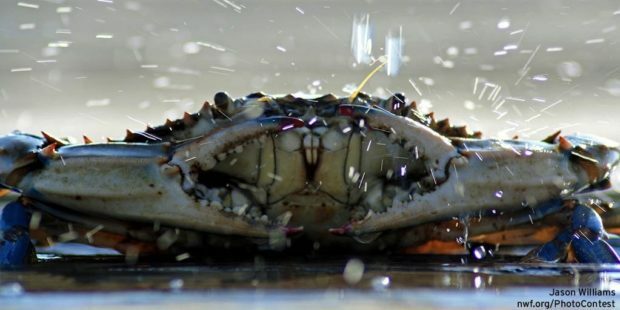 The blue crab is iconic to Chesapeake Bay. In 2009 the National Wildlife Federation helped launch the Choose Clean Water Coalition to advocate for restoring the thousands of streams and rivers flowing to the Chesapeake Bay. The coalition brings together more than 230 organizations from Pennsylvania, New York, Maryland, Delaware, Virginia, West Virginia, and the District of Columbia to speak up for clean water. Together we are supporting the implementation of state clean water blueprints and Chesapeake Bay pollution limits. Nutrient and sediment pollution from farms is by far the largest source of contamination in the Chesapeake Bay and its tributaries. There are 87,000 farms in the six-state Chesapeake region and those that are well run protect their water resources and add much to our landscape, environment, and economy. We want to ensure that these responsible farms and farmers remain economically viable, and this new bill will help to do just that. The Chesapeake Bay and its tidal tributaries have 11,684 miles of shoreline—more than the entire U.S. west coast. The Van Hollen/Scott Chesapeake Bay Farm Bill Enhancements Act of 2017 makes some important changes to the Regional Conservation Partnership Program (RCPP) which is intended to provide farmers with additional funding for conservation practices that will lead to cleaner streams and rivers as well as a healthier Chesapeake Bay. There are many farmers in the Chesapeake region doing great things for their farms and their local waterways, and this bill is intended to provide them with additional resources to do more. The National Wildlife Federation and the Choose Clean Water Coalition look forward to continuing to work to improve conservation programs such as RCPP in the 2018 Farm Bill. Learn more about our work to protect and restore the Chesapeake Bay.